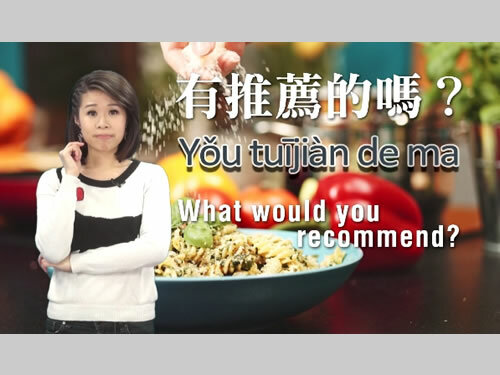 有推薦的嗎？　Yǒu tuījiàn de ma What would you recommend? 我不吃辣　Wǒ bù chī là I don’t eat spicy food. 辣不辣？　Là bù là Is it spicy? 我要這個　Wǒ yào zhège I’ll have this. 我要一杯珍珠奶茶　Wǒ yào yībēi zhēnzhū nǎichá I’ll have a cup of pearl milk please. 我要冰的/熱的　Wǒ yào bīng de/ rè de I’ll have it cold/hot. 有啤酒嗎？　Yǒu píjiǔ ma Can I have a beer? 有素的嗎？　Yǒu sù de ma Do you have anything vegetarian? 幾位？兩位　Jǐ wèi? Liǎng wèi How many people? Two.